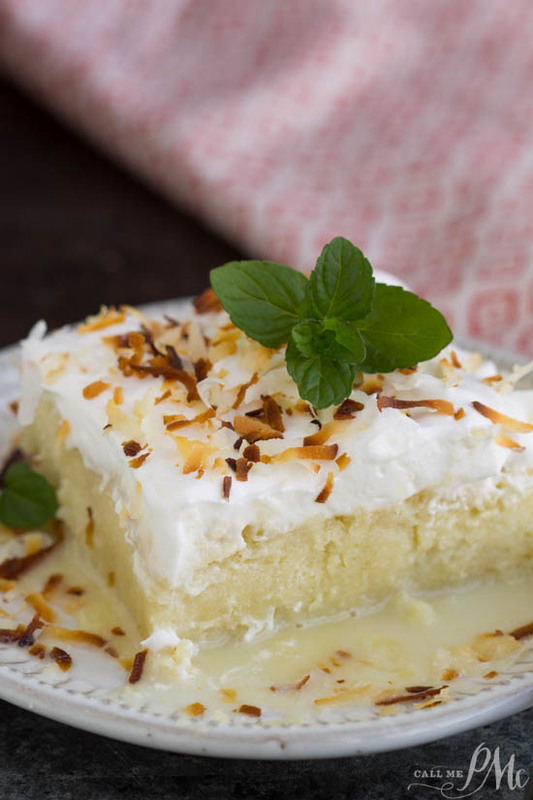 Light, sweet, and spongey, this Tres Leches Coconut Cake is perfect for warm weather! 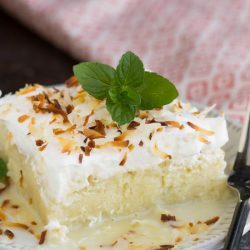 Fluffy Tres Leches Coconut Cake is soaked with milk, frosted with whipped cream, and topped with toasted coconut. 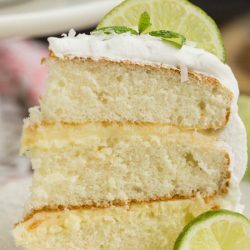 A wonderful coconut sponge cake soaks up a trio of milk and makes this an unforgettably luscious dessert. 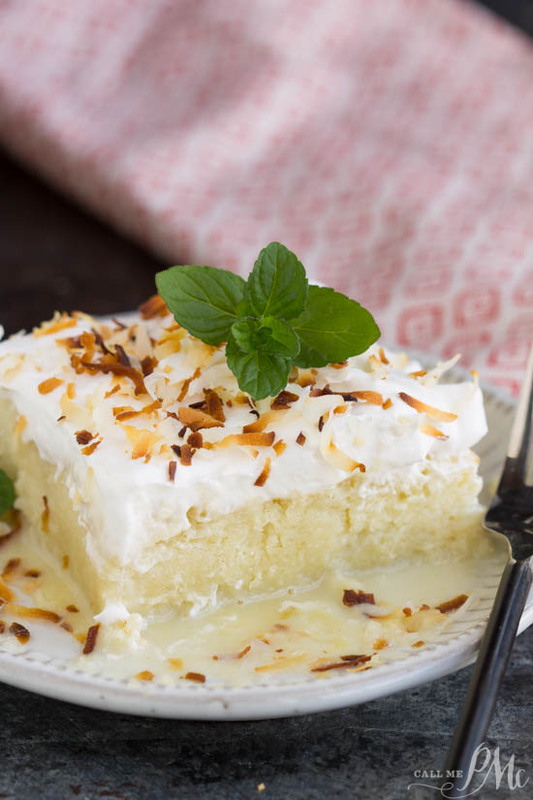 If you like coconut and you like cake, you’ll love this dessert! This is the moistest, tastiest cake ever. 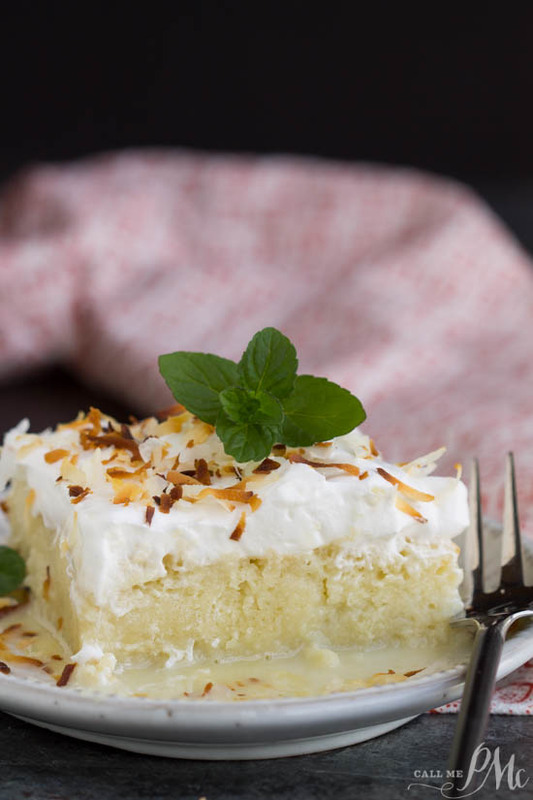 Sweetened condensed milk, whole milk, and coconut milk is poured over the hot sponge cake. After sitting and soaking in the milk, this dessert turns into a cake-like pudding. 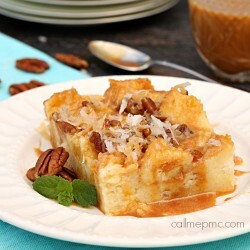 Very similar to a bread pudding, it’s creamy but still retains a cakey consistency. It’s not overly sweet. But, just sweet enough that you can keep eating and eating. It is simply irresistible. 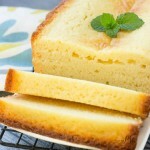 The cake is a basic sponge cake and easy to make. While it’s hot, poke holes in the top and pour that glorious combination of milk over it. That’s it. Allow it to sit and drink in that milk goodness. While this is happening toast coconut for the garnish. I made homemade whipped cream and frosted my cake with it. If you prefer, you can use a premade whipped cream like Cool Whip brand. Be sure your cake is completely cool before frosting it. You can use toasted or untoasted coconut on the top. Visit my Amazon store for my favorite baking pans. I used this 9×13 baking pan. Place 1 cup of coconut flakes in a large skillet. Cook over medium heat, stirring frequently until the flakes are mostly golden brown. I used sweetened coconut for my cake. If it’s sweetened it tends to brown faster. Watch carefully and don’t leave it unattended, the coconut browns quickly. 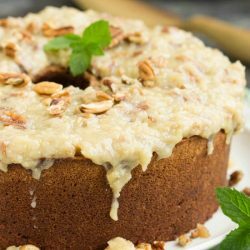 The original 'Poke Cake', Tres Leches Coconut Cake, is moistened and flavored with three milks making the cake creamy and luscious. Preheat the oven to 350 degrees F. Prepare a 9x13-inch baking pan with non-stick spray. In a bowl, add sugar and butter. Whip until creamy. Stir in egg yolks and mix until smooth and fluffy. To the egg yolk mixture, add 1 cup of the coconut milk and mix. Add flour and baking powder, mix until incorporated. Add 1/4 cup whole milk and mix. In another bowl, beat the egg whites until stiff peaks form. Gently fold the whites into the egg yolk and flour mixture. Pour mixture into prepared pan and bake 30 to 35 minutes. Text for doneness with a wooden pick. The cake is done with no crumbs or dry crumbs are on the stick when inserted into the middle of the cake. While the cake is baking toast the coconut. Mix the sweetened condensed milk, 1/4 cup coconut milk, and 1/4 cup whole milk together. When the cake is done, remove from the oven. While the cake is hot, poke holes in the top with a fork or skewer. Pour the milk over the cake. Allow the cake to sit and soak in the milk. When the cake is completely cool, frost with whipped topping. Hi I have a question, what kind of coconut milk did you use? Is it from the can or carton refrigerated? I used it in a can. Shake it good first.